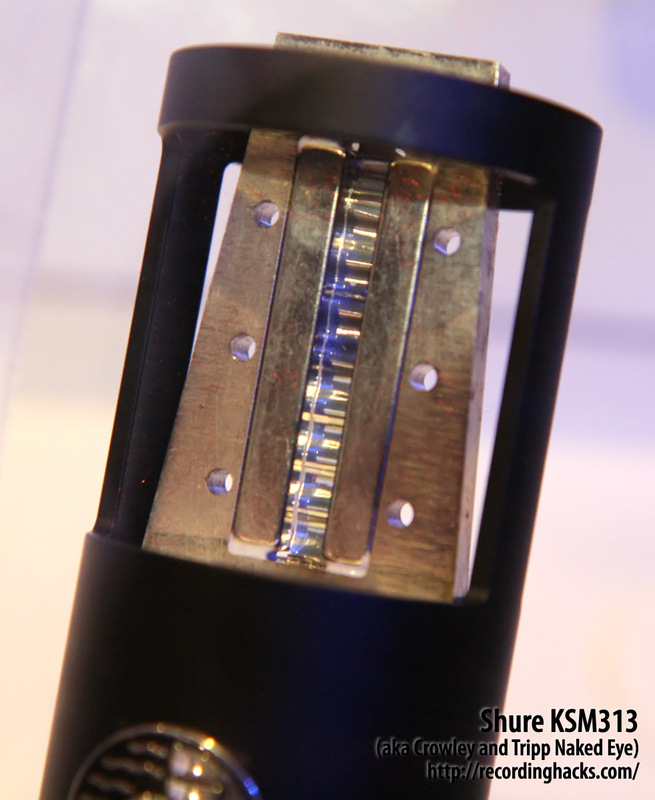 The Shure KSM313 is a rebadged Crowley and Tripp Naked Eye Roswellite ribbon microphone, a passive bidirectional ribbon microphone with two distinct voices and Crowley and Tripp’s proprietary “Roswellite” transducer material. The mic was originally introduced with a conventional foil ribbon in 2006, as the Crowley and Tripp “Naked Eye.” Its innovation was the use of differing materials and construction techniques to produce distinct “impedance gradients” on the two sides of the transducer. This resulted in two distinct voices from the two sides of the figure-of-8 pickup pattern. 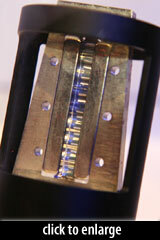 In 2008, Crowley and Tripp introduced a new “super-elastic paramagnetic composite” ribbon material somewhat ironically termed “Roswellite.” It’s effectively indestructible when used as a ribbon microphone transducer, yet it provides sonic qualities as good as the best conventional aluminum foils. Shure Bros. purchased the entire Crowley and Tripp microphone company from Soundwave Labs in 2009, including the rights to the Roswellite production process. See the profiles for the original Naked Eye (aka “Classic”) and the Naked Eye Roswellite for additional information and reviews of this microphone. Shure ships the KSM313 with its original “monacle mount” (Shure p/n A313M) and a shockmount, in a mahogany storage box. Like the Crowley and Tripp version of the microphone, the KSM313 is built by hand in the USA. I found the KSM313’s logo side to sound full and round, reminiscent of the RCA 44 ribbon with the RCA sounding slightly “honky” in the midrange. The backside sounded very close to the front of AEA’s R84 ribbon — more extended high frequencies, yet it retained most of the fat low end… By way of comparison, a good-sounding Royer R-121 was slightly “scooped out” in the midrange relative to all these mics. Frequency Response - Bidirectional (Front)Click Graph to Compare! Frequency Response - Bidirectional (Rear)Click Graph to Compare!